12/16/1955 Minutes of Meeting of Skagit County Chapter, Puget Sound Flood Control Council Composed mostly of Dike District Commissioners the Council discussed the proposed "cut-off" on the North Fork of the Skagit River. No one mentioned the impact of tides on flood flows. One concern was that the new channel would deposit silt in the channel East of Whidbey Island which could impact navigation. Predicted the South Fork of the river would be almost non-existent in a very few years. Dike Districts talked about forming a County-wide Flood Control District to simplify the levying of taxes for local participation. Letter addressed a meeting in which "reorganization" of the dike districts was discussed. It was the first seed planted for the formation of the current Skagit County Flood Control Zone District. "In an effort to develop and present a united position on a flood control plan and program, which plan may be that of the Corps of Engineers now tentatively proposed, a flood control advisory committee was selected from the total number of diking districts on the valley floor to represent the full community interested in and likely to be affected by floods and their control." ... "Upon a general discussion of the proposed Corps' project (a. levees and channel improvement; b. Avon Bypass; and c. upstream storage), consolidation of the sixteen diking districts was quite thoroughly explored. Either a flood control district (86.09 RCW) or a flood control zone district (86.15 'RCW) appears to be a superior, legal vehicle over reorganization under their present diking district laws (Title 85 RCW)." 1/17/1967 Skagit County BCC ltr to Corps re establishment of Citizens Advisory Committee on Flood Control BCC let Corps know they planned on setting up a county-wide flood control district. Also would hire more qualified staff to handle flood control items in the future. Ltr was in response to Corps August 25, 1966 ltr. 1/27/1967 CORPS ltr in response to 1/17/1967 ltr Corps let BCC know that they were willing to work with the committee. 2/3/1967 Corps Daily Log entry re telephone conversation with County Engineer Corps wanted new flood control committee to call itself the Water Resource Planning Committee rather than a Flood Control Committee so that it could start out with an objective of having a comprehensive look at all aspects of water resources planning rather than limit themselves to flood control. 2/20/1967 DF re Meeting With Local Interests on Skagit River Basin Planning It was Corps idea to form Water Resources Committee. One purpose of the committee was to form countywide Flood Control District for project sponsorship. 8/25/1967 DRAFT Resolution from WRAC to County Commissioners Purpose of FCZD was to raise taxes for flood control activities. Agreed to comp plan (attached) that would raise levees to 8 year protection to include "fuse plugs" to eliminate critical levee failures. In addition, a program of public information and control of the flood plain will be adopted to insure that developments are controlled and a false sense of security does not exist. 10/19/1967 MFR re Skagit County Commissioner Attempts to Form Countywide Flood Control District Corps wanted local funds in hand by January 1, 1967. FCZD was not formed until 9/1/1970. See Resolution re: Countywide Flood Control Zone District. This resolution established the Skagit County Flood Control Zone. 11/25/1970 DF re Avon By-pass and using trash for levee fill Locals wanted to know if they could use "encased solid waste" for levee construction. We could change Mt. Vernons name to Mt. Trashmore. County also wanted to know if they could "bid" on the levee projects. County established countywide flood control zone. Levee improvement project was tied to Avon By-Pass or upstream storage. Urged Corps to implement flood control storage. 6/17/1971 Corps ltr to County Commissioners re additional requirements for Corps project other than the formation of Flood Control Zone District Corps wanted to be assured of "continuing maintenance" of project and wanted county to be aware that they were responsible for additional right-of-way acquisition cost. 7/17/1975 Series of letters re Congressman Meeds inquiry re changes in the deferred to active project list. Congressman used recycled paper for his stationary. BCC wanted to activate the 1966 Levee and Channel Improvement project; achieve additional storage behind Baker Dam; have a study done on the feasibility of the Sauk River Dam; agreed that if Sauk not feasible then would look at Avon Bypass. "We, as a Board, know that we are sitting on a "Time Bomb" in the Skagit Valley. Corps Public Brochure re Skagit River Levee and Channel Projects See also Public Meeting Transcript and 3/23/78 SVH for a meeting summary. Pg2...The 100-yr flood at SW is estimated at about 215,000 cfs. Pg3...The existing levees below Burlington vary in level of protection ... from 84,000 cfs to 130,000 cfs with a minimum 2 ft levee freeboard. Pg7...The two "PSE" dams on the Baker river provide flood control for the Baker River Basin which amounts to approximately 10% of the Skagit River drainage ... Skagit River flood damages in Dec 1975 totaled $3,247,000... Skagit County has considered a comprehensive flood control plan to guide future planning and has formed a county-wide flood control district to enable the county to sponsor flood control improvement projects. (See 1973 Comp Plan Alternatives for the Skagit ) which was clearly never enforced. 1/21/2001 WAC 173-145-040: Comprehensive flood control management plan What must be in the CFHMP/CFCMP by state statute. 1/17/2006 Draft Interlocal Agreement for Flood Control Zone District Draft Interlocal Agreement to activate FCZD, has neither environmental nor land use component. 3/15/2006 Draft letter to be sent to dike districts/cities and towns Document explains that County was going to form SCFCZD. 4/24/2007 Public Works Dept. Memo re Rough cost estimate for FCZD planning purposes. "With the development of the flood control project, some areas may not receive 100-year protection and a variety of floodplain management techniques will need to be evaluated. This may include buy-outs, elevation of structures, flood proofing, and changes to the current zoning and regulations to prevent development in areas that have been identified as flood prone." "The proposed Flood damage reduction measures were designed so that the Corps hydraulic analysis can evaluate a range of flows with an attempt to optimize the benefit to cost ratio." 4/25/2007 Agenda for meeting between County Public Works Department and Consultant Items to be discussed included doing away with Sub-Flood Control Zones and taxing cities and diking districts. 4/25/2007 Countywide Flood Control Zone District Data Requirements Consultant request info for activation of SCFCZD. 5/1/2007 Update to verbiage in planning memo County updates proposed projects list. 5/3/2007 Update to verbiage in planning memo Further clarification of what planning memo intended. 5/21/2007 Draft Outline for FCZD presentation to County Commissioners "Need to fully address the sales tax option as suggested by LK". 5/21/2007 Gene Sampley comments on FCZD presentation Did not want to discuss sales tax issue and did not want the people of Skagit County to vote on instituting a property tax. 7/5/2007 Public Works Draft Strategy for Skagit River Flood Control Once again the P/W personnel show signs of not wanting voters to have say. 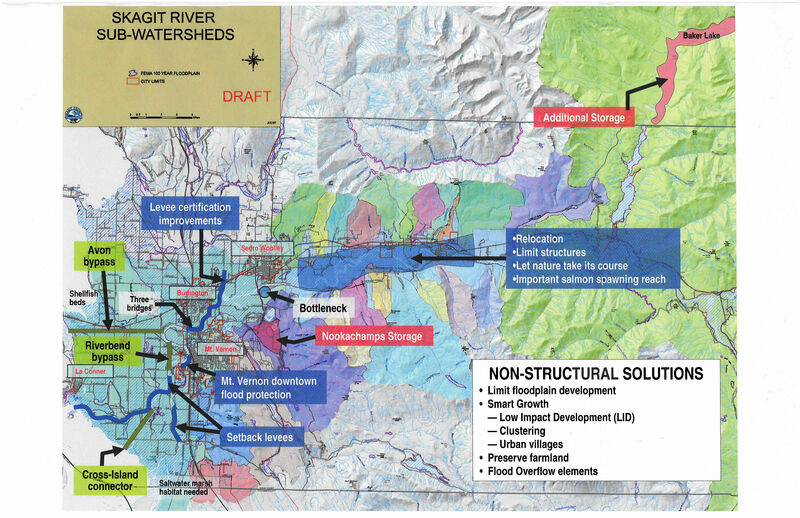 7/12/2007 Draft Strategy for Skagit River Flood Control Revised version including proposed committee members. 7/12/2007 Gene Sampley comments on draft strategy Won't have salmon recovery program out of flood control process. 7/27/2007 Draft Executive for FCZD 66% of the people who do not live in floodplains are not adequately represented on this committee. 7/27/2007 Draft Structure of FCZD Clearly shows BCC in charge. 7/27/2007 Draft Technical Committee makeup Dike Districts overly represented. 7/30/2007 Gene Sampley changes to FCZD resolution Wanted to separate Plan Development from FCZD organization. Gene Sampley Draft Skagit River Comprehensive Flood Hazard Management Plan That Improves Flood Control and Benefits Salmon Recovery Resolution which replaces the flood control committee with the FCZD governance structure plus have the FCZD Executive Committee "recommend long term funding options based on drafts developed by staff to fund construction of the recommended projects" plus emphasizes doing both flood control and salmon recovery and finally seek Corps of Engineers assistance. 8/20/2007 Draft Organizational Structure for Flood Control Zone District A work in progress. 8/21/2007 Draft Flood Control Zone Organization Resolution Lots of changes from the original draft. "The revised PMP identifies Federal and non-Federal funding requirements and assigned responsibility for performing identified studies and activities required to complete the feasibility study phase." Appears Skagit County is proceeding with countywide flood control zone district (property taxes). Video of meeting can be viewed at http://skagit.granicus.com/MediaPlayer.php?view_id=2&clip_id=129 Document purports to establish timeline and cost of new and improved GI Study. County on hook for over 3 million dollars over next three years. Schedule admitted to as being "optimistic" as best. #1a. Shows everyone that the SCFCZD is controlled by the County Commissioners who have ultimate decision making power. #1b. Shows purpose and number of "Advisory Committee" members (15). Public limited to 3 minute presentations. "Advisory committee will be tasked with funding." #1c. Public Works Dept. staff roles for the SCFCZD. 11/5/2007 Skagit River Flood Control Committee Meeting Minutes Committee discussed the Flood Control Zone District, the GI Study, widening the 3-bridge corridor, preparing for FEMA FIRM appeal, Skagit River gauge finances and emergency response to floods. 11/6/2007 Packet to Activate Skagit County Flood Control Zone District (SCFCZD) Packet of information the Skagit County Commission used to approve the activation of the Skagit County Flood Control Zone District. Updated to have the final, signed resolution. 12/30/2007 SKAGIT COUNTYWIDE FLOOD CONTROL DISTRICT – AN EVOLUTION IN PROGRESS An inside look at the history and the development of the countywide flood control district through the use of historical documents and e-mails by county officials. 1/2008 Update description of Skagit County Public Works involvement with Flood Control Zone District Document describes the activities of the Public Works department with respect to the flood control issue. 5/05/2008 Skagit Comprehensive Flood Hazard Management Plan 3rd Technical Committee Members Workshop Skagit Comprehensive Flood Hazard Management Plan (CFHMP) group members brief one another and then dissolve into SC FCZD technical committees. 5/05/2008 SC FCZD Dike and Drainage Technical Committee Meeting Draft Meeting Summary Committee designates chairs plus advisory committee members and then advanced an agenda of further flood control work, with an emphasis on dike & drainage district involvement. 5/05/2008 SC FCZD Environmental Technical Committee Meeting Draft Meeting Summary Committee votes for a chair, a vice chair plus advisory committee members and then discusses when they'll meet. 5/05/2008 SC FCZD Land Use Technical Committee Meeting Draft Meeting Summary Committee designates leaders and then allowed Liz McNett Crowl with the Active Community Task Force to join them to provide a recreational perspective. 5/19/2008 Skagit County Commissioners Resolution #R20080254 Skagit County Commissioners set membership in the SC FCZD Advisory Committee. 5/22/2008 First FCZD Advisory Committee Meeting Announcement Announcement of first SC FCZD AC meeting. 5/30/2008 Agenda for 1st Advisory Committee Meeting on June 9 Agenda for kickoff of the SC FCZD AC, scheduled for 4 to 6 PM at the Skagit Room in the County Building at 1800 Continental Place, Mt. Vernon. Map from June 9, 2008 Skagit County Flood Control Zone District Advisory Committee meeting showing possible floodplain management projects for the Skagit River Basin. 6/9/2008 Tetra Tech Presentation on Comprehensive Flood Hazard Management Plan Roadmap 35 slide roadmap prepared by Tetra Tech for drafting the Skagit County Comprehensive Flood Hazard Management Plan (CFHMP) by the Skagit County Flood Control Zone District Advisory Committee (SC FCZD AC). Skagit County Public Works Department Public Announcement of upcoming 2nd meeting of the Advisory Committee. Document put together by consultant “Triangle”, titled Initial Questions Needing Responses in CFHMP Process. 7/14/2008 DRAFT SC FCZD AC Meeting Summary Draft minutes from the July 2008 SC FCZD AC meeting. Proposed requirement of two meetings before a major decision can be made by the SC FCZD Ac. Responses to questions on “video recording future AC meetings”, SC FCZD AC versus former Skagit River Flood Control Committee, a draft resolution to amend SC FCZD AC operating rules, a “cost breakdown” of the GI study and more information on the Natural Hazard Mitigation Plan. 8/5/2008 Skagit Flood Control Study Costs - 1997 through December 31, 2007 Payments by jurisdictions for the Corps GI Study. Corps of Engineers will deliver a report to the SC FCZD AC on Skagit GI Preliminary Measures. 08/27/2008 Skagit County Planning Comments on City of Burlington and Dike District #12 Determination of Significance and Request for Comments on Scope of EIS [for Ring Dike] County Planning Department raises seven concerns. What, when, where, who and why of the upcoming September 15, 2008 SC FCZD AC meeting. After regular business, presentation by the City Gov't of Burlington & Dike District 12 on their 100-year ring levee and more. Staff's draft summary of the July 2008 SC FCZD AC meeting. Staff's draft summary of the August 2008 SC FCZD AC meeting. 23-page PDF of presentation to SC FCZD AC, includes slides about Skagit River Flood Risk in reaches of the river, the floodway issue, Crofoot's Addition investigation led by City Gov't of Burlington, and discussion of proposed levee enhancements as well as consequences of incorrect hydrology. Overview of needs of a CFHMP. Staff-created draft of strategic plan for the SC FCZD AC's meetings. 9/22/2008 SC FCZD AC Chair Letter to Skagit County Commissioners, Re: City of Burlington Flood Control Project SC FCZD AC Chair requests for the AC "clarification as to the type of recommendation the BCC is expecting" from the committee. General summary of planned activities for Sept. 2008 SC FCZD AC meeting. Staff's draft summary of the September 2008 SC FCZD AC meeting. General summary of planned activities for Nov. 2008 SC FCZD AC meeting. Document C, Criteria for Considering Projects, is still a work in progress. Staff's draft summary of the October 2008 SC FCZD AC meeting. Current progress of the SC FCZD AC on Potential mission, short-term and long-term goals, objectives, and measurement criteria for the Skagit River Comprehensive Flood Hazard Management Plan (CFHMP). “The Skagit County Flood Control Zone District Advisory Committee requested that each Technical Committee (Environmental, Dike and Drainage, Land Use) develop recommendations regarding flood project screening/selection criteria. This document provides a compilation of criteria developed by the three Technical Committees. Formal implementation of SC FCZD AC proposals that "action" on major issues would require two SC FCZD AC meetings or a supermajority of SC FCZD AC members plus a procedure for amendments to the Operating Rules and Procedures. Discussion on the Corps of Engineers General Investigation (GI) Process using these documents. Discussion on the definition of maximum flood risk reduction. Discussion of supporting continued county-wide participation in the federal Community Rating System (CRS) of the National Flood Insurance Program. Itemized budget for education of Skagitonians about the Skagit River Flood Risk for SC FCZD AC review. General summary of planned activities for Dec. 2008 SC FCZD AC meeting. Meeting will be held on Jan. 20, 2008 between 2:00 p.m. and 5:30 p.m. at the Training Room at 325 Metcalf Street, Sedro Woolley. Primary purpose will be focusing the Corps GI process onto specific flood risk reduction opportunities. Staff's draft summary of the December 2008 SC FCZD AC meeting and table of attendees. Updated to reflect input from the Advisory Committee and Land Use Technical Committee (LUTC) input. The means to which a project or projects will be decided to be built and/or implemented to reduce the Skagit River Flood Risk. Meeting notices for the SC FCZD Advisory Committee and Technical Committees. Purpose is mainly to “Adopt screening and fatal flaw criteria for considering projects/measures” and “Begins the process of a local screening of the Skagit GI Measures and any local projects using screening and fatal flaw criteria in order to, from a local perspective, narrow measures to a smaller number”. Summary of activities of Jan. 20, 2009 SC FCZD AC meeting. Final mission, goals and objectives document to be approved at Feb. 18, 2009 SC FCZD AC meeting. List of proposed measures and their review by the SC FCZD technical committees. Purpose is to screen flood risk reduction opportunities for the Corps of Engineers to review for a potential future project. General summary of the meeting's activities. Two options for must-pass criteria for any Skagit River Flood Risk reduction project. 4/20/2009 AC Meeting Hand-Outs for April 20, 2009 A table explaining how all the handouts relate to one another. Current iteration of criteria for the Corps of Engineers to consider floodplain management projects for the Skagit River Basin. Map of lower Skagit River Basin showing in bold lines along the Skagit possible overtopping levee sites. Idea is to protect the railroad and interstate as well as connect to downtown Mount Vernon flood protection. Summary of the meeting that discussed potential activation of the property tax levy powers of the Flood Control Zone District (FCZD), identifying feasible projects and working with other jurisdictions on hydrology & Baker River flood storage. Nine proposed measures to reduce the Skagit River flood risk to be fast tracked. Latest version of Document E-4, incorporates habitat restoration, emergency overflow spillway and Mount Vernon comments on potential projects. Incorporates changes from previous SC FCZD AC discussions about this document. Technical Committees assigned to review the potential of an emergency overflow spillway at Avon and also habitat restoration projects in the Upper Basin tributaries. 7/14/2009 Public Meeting Notice Notice of upcoming advisory & technical committee meetings. 1. To convene for a joint meeting with the FCZD Board of Supervisors (Skagit County Commissioners) in order to discuss AC flood planning efforts to-date and future challenges. 2. To provide an opportunity for Puget Sound Energy to respond to an invitation to present an overview of the Baker dam(s) flood storage planning efforts. 3. For the AC to consider an approach and timeline for completing the Comprehensive Flood Hazard Management Plan. List of one rejected and eight accepted projects to fast-track to approval by the SC FCZD AC. 8/17/2009 Agenda for August 17, 2009 SC FCZD AC Meeting Meeting will be focused on screening potential projects. Updated by SC FCZD staff to reflect recent modifications by advisory committee & technical committees. Document carried over from previous meetings. Last version incorporates habitat restoration, emergency overflow spillway and Mount Vernon comments on potential projects. Updates to screening criteria for the DDTC. 8/18/2009 Environmental Technical Committee Request for Advisory Committee Motion Recommends support for the measures of a 3-bridge corridor levee replacement plus wider corridor & a Fir Island Bypass. Flood control engineer recognizes that all flood control projects are subject to fill and grade permits, Shoreline Management Act, SEPA and must comply with the Flood Damage Prevention Ordinance. Tingley letter documenting work done by the snagboat W. T. Preston as well as a dispute between Norman Hamburg and a Mrs. Halverson over removing a stump. Recommends support for the measures of a 3-bridge corridor levee replacement plus wider corridor & a Fir Island Bypass. List of measures the Skagit County Flood Control Zone District (SC FCZD) committees are considering for incorporation into the Skagit County Comprehensive Flood Hazard Management Plan (CFHMP). 10/19/2009 Agenda for October 19, 2009 Meeting (Handout 1) Primary objective of meeting is to hold a final vote on project screening criteria and a first vote on preliminary projects. MVH - "Heavy Rains Cause A Raging Skagit"
Table of historic flood flows from 1815 to 2009. Listing of news articles in the Historical Newspaper Article database about the 1917 flood. This is a retyped version of Mr. Stewart's 1918 work product. Footnotes were added to explain terms and indicate handwritten notes that appeared on the original. NOTE: You can do word searches on this document. Final Draft of the criteria the SC FCZD AC will use to screen potential projects for inclusion to the Comprehensive Flood Hazard Management Plan (CFHMP). News article clearly shows 1909 flood was a "double-pump" event. Clearly a lot of urban encroachment south towards the Skagit River since then. 2/16/2010 Agenda for Feb. 16, 2010 Meeting Meeting is to review discussion on FEMA Flood Insurance Rate Maps plus review chapters 1-4 of CFHMP. 2/10/2010 CFHMP Draft Chapter 1 Draft Introduction to Skagit River Comprehensive Flood Hazard Management Plan/CFHMP as of Feb. 10, 2010. 2/10/2010 CFHMP Draft Chapter 2 Draft Skagit River Basin Characteristics section of Skagit River Comprehensive Flood Hazard Management Plan/CFHMP as of Feb. 10, 2010. 2/10/2010 CFHMP Draft Chapter 3 Fundamentals of Flooding section of Skagit River Comprehensive Flood Hazard Management Plan/CFHMP as of Feb. 10, 2010. 2/10/2010 CFHMP Draft Chapter 4 Flood Warning and Operations in the Skagit River Basin section of Skagit River Comprehensive Flood Hazard Management Plan/CFHMP as of Feb. 10, 2010. 4/19/2010 Agenda for April 19, 2010 Meeting Meeting is to review membership, funding issues, updating the draft CFHMP as well as the recent trip to D.C. for federal assistance. Meeting w/ US Senator Patty Murray on attempting to get funding for the Corps of Engineers Skagit General Investigation Study. Most recent draft of CFHMP Executive Summary. LJK Presentation to Skagit County Commissioners urging formation of a flood agency and excise sales tax to be used specifically for flood project construction. 6/19/2010 Draft as of June 19, 2010 of Chapter 7 of CFHMP: History of Flood Management This section of the CFHMP discusses the studies conducted and some of their findings on the Skagit River so far. 6/21/2010 Agenda for June 21, 2010 Meeting Meeting will be to plan future flood control efforts thru a Blueprint and also the first draft of the Combined Flood Hazard Management Plan/CFHMP. Skagit County Commissioners recognize resignations and replacements on the Flood Control Zone District committees. 9/20/2010 Agenda for Sept. 20, 2010 Meeting Discussion on FEMA Flood Insurance Rate Maps/FIRMS and review of Comprehensive Flood Hazard Management Plan/CFHMP. 10/25/2010 Agenda for Oct. 25, 2010 Meeting Review of Comprehensive Flood Hazard Management Plan/CFHMP Chapters 1-4 and regular business. 10/25/2010 Agenda for Nov. 15, 2010 Meeting The meeting has been moved to Fisher Slough for a site visit & Dike District 3 HQ in Conway. Will also have report outs. LJK Presentation given to the SC FCZD AC about questions concerning the datum used for historical floods at Sedro-Woolley and the impacts on Ross Dam Storage. Items to be discussed include a conversation with the County Commissioners, the GI Study and its finance, Flood Spreading Project/FSP, funding and FERC Relicensing Article 107 (c). 9/19/2011 Agenda for September 19, 2011 Meeting The meeting will elect a new chair, give an update on the Skagit GI study & Baker FERC Relicensing 107 (c)/Baker River Dam Storage. Timeline of efforts to get a plan for drawdown of the Baker River Dams before a major flood. “1. Use available Corps funding to complete the Feasibility Scoping Meeting Report and submit it to Corps Headquarters by October 1, 2011. Work tasks will need to stay "on schedule" in order to meet this due date and weekly Corp phone conferences will be established to track progress and any resource needs. Letter thanking the Colonel and recapping pledges from the June meeting in DC on the Skagit GI. Meeting will discuss Skagit River GI & Baker FERC Relicensing 107 (c). Meeting will have a Skagit GI Update & a nhc Hydraulic Effectiveness Report presentation. A series of spreadsheets in small print showing the impact in CFS of potential flood projects. 1/12/2012 nhc Presentation to SC FCZD AC, Re: Skagit River Flood Risk Management General Investigation Hydraulic Effectiveness of Measures 33 slide presentation on the Skagit River Flood Risk reduction potential of measures being reviewed by the Skagit River GI Study. Hydrology is from the Corps March/April 2011 report. Meeting will have a Skagit GI Update, CFHMP Update & finally a discussion on "funding". Ideas to get floodplain management measures into the Comprehensive Flood Hazard Management Plan (CFHMP), address the debris-attracting railroad bridges over the Skagit and find sources of funding/revenue. Meeting will have a Chairman Comment, a Historical Perspective, a Skagit GI Update, a Feasibility Scoping Meeting report and Public Comment. “Dan Berentson reported the U.S. Army Corps of Engineers (USACE) has received $700,000 to continue the Skagit GI for Fiscal Year 2012. The USACE is scheduling the FSM for March. Kara Symonds added the USACE is currently preparing for the Alternatives Formulation Briefing. Preparation includes the 10% design of the alternatives, the cost-to-benefit ratio of each alternative, recommend the National Economic Development plan, and the Locally Preferred Plan. “Symonds explained the purpose of the report is to document technical studies and findings related to flood risk management of the Skagit River basin. Once a report is ready, the USACE can schedule a meeting to discuss it. This is a continuation of the report that was submitted in 2009, which received several comments that needed to be addressed. Additional comments and responses were received in 2011, as well. The final submittal includes things such as all comments, environmental and economic reports, levee failure analysis, basin description, and alternatives formulation strategy. This is the meeting anticipated to take place in March. Meeting will have two second votes on housekeeping issues, a Skagit GI Update / Feasibility Scoping Meeting Read-Ahead Report, and a Alternatives from Project Delivery Team Workshop Presentation. 4/16/2012 Corps of Engineers Presentation Skagit River General Investigation Preliminary Alternatives 22-slide presentation explaining the GI Study and current alternatives. Meeting will be mainly be an alternatives workshop w/ Army Corps of Engineers Seattle District staff. The April meeting discussed a new attendance rule where missing three meetings without a proxy can mean dismissal, the six alternatives the Corps of Engineers Seattle District Project Delivery Team (PDT) came up with, and a Q&A session. Questions posted to the Flood Control Zone District Advisory Committee and Technical Committees about the six Preliminary Alternatives the USACE Seattle District has came up with. 7/16/2012 Agenda for July 16, 2012 Skagit County Flood Control Zone District Advisory Committee Meeting Meeting will have regular business, a Skagit GI Update and a Puget Sound Energy presentation. “The AC and TCs were previously given a link to the Preliminary Alternatives presentation, a PowerPoint of the presentation, and a Read-Ahead document. The group attended an alternatives presentation in April, as well. The AC and TCs were also provided with a list of questions, for each alternative, to begin thinking about. For reference, the questions are attached to this meeting summary under Attachment A. 9/17/2012 Agenda for September 17, 2012 Skagit County Flood Control Zone District Advisory Committee Meeting Topics planned for discussion include a GI Study Update, Dam Storage, and a Farm, Flood, Fish Initiative plus regular business. 9/17/2012 Skagit County Public Works Update Presentation on Corps GI Study Skagit County Public Works gave an update to the Skagit County Flood Control Zone District Advisory Committee (Issues Page) on the Skagit GI. Last page is the latest timeline with a projected Fall 2015 completion date. 12/10/2012 Agenda for December 10, 2012 Skagit County Flood Control Zone District Advisory Committee Meeting Meeting will discuss general business items plus the Farm, Fish, Flood Initiative. Also discussion about Lower Baker Dam storage & the Farms, Fish and Floods Initiative (3FI). 2/19/2013 Agenda for Skagit County Flood Control Zone District Advisory Committee Meeting of Feb. 19, 2013 Meeting will discuss Skagit GI, have a Congressional Update and public comment. “More documents will be posted to the County website including the presentation from the last AC meeting, a summary of all public comments received regarding the alternatives, as well as, the U.S. Army Corps of Engineers’ (USACE) summary of the alternatives process. It was expressed later in the meeting that Kunzler would have preferred the comments be better documented; specifically what WSDOT shared with the USACE. Many comments do not appear to have been written down. Dan Berentson understood WSDOT to say the cost-tobenefit ratio of keeping water off I-5 may not be feasible. WSDOT was tasked with providing numbers to the USACE for review. 2/19/2013 Recording of Feb. 19, 2013 SC FCZD AC Meeting Recording of the SC FCZD AC Meeting. Meeting discussed dam storage, NEPA, and FCAAP (Flood Control Assistance Account Program). 4/15/2013 Agenda for Skagit County Flood Control Zone District Advisory Committee Meeting of April 15, 2013 SC FCZD AC meeting will discuss Skagit River GI Study and the Farm, Fish, Flood Initiative. “Kara Symonds reiterated NHC is under contract with the U.S. Army Corps of Engineers to conduct the alternatives analysis for the Skagit River GI. The work was slightly delayed, but work is still expected from NHC. The consultant is studying the effectiveness of storage at the Upper and Lower Baker Dams, some issues with modeling at the Burlington-Northern Santa Fe Bridge, and modeling all three alternatives. Alternatives will be analyzed and compared further when the information is complete. The public outreach plan will most likely include the USACE providing a presentation to the AC, City Councils, and upriver groups. 6/17/2013 Agenda for Skagit County Flood Control Zone District Advisory Committee Meeting of June 17, 2013 Meeting will discuss funding; Farm, Fish, Flood Initiative; an update on the Skagit River GI Study and the Skagit River I-5 Bridge Collapse - for starters. “After several modeling runs, the system-wide levee setback alternative shows it is not effective in reducing spill at Sterling or south of Mount Vernon. In addition to setting them back, levees would have to be raised. Therefore, the alternative will morph into one that protects urban area. An alternative of this significance is not hydraulically effective, particularly between the Burlington Northern Santa Fe and Division Street bridges. Potentially, it could be used in mitigation. Six page handout for the November 16, 2009 SC FCZD AC meeting on funding options for flood control. Next FCZD AC Meeting Superseded by Work Session “The next FCZD Advisory Committee meeting, which would have been scheduled Monday, November 18, is superseded by a work session before the Board of Skagit County Commissioners. The U.S. Army Corps of Engineers will be in attendance to assist County staff with providing an update on the Skagit River General Investigation. This work session will be recorded by Skagit 21. Skagit Cty Public Works GI Study Status Update Video Video of Skagit County Public Works & Corps of Engineers Seattle District update on the Skagit River General Investigation Study (GI Study). Skagit River General Investigation Status Update Presentation to Skagit County Commissioners 19-slide presentation of a public update on the Skagit River General Investigation Study (GI Study). Focus of the presentation is on preferred alternatives and timelines.